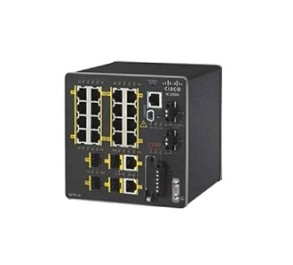 The Cisco® Industrial Ethernet 2000 (IE 2000) Series is a range of compact, ruggedized access switches that handle security, voice, and video traffic across industrial networks. They provide customers in industries such as automotive, oil and gas, mining, transportation, and energy with highly secure access and industry-leading convergence using Cisco Resilient Ethernet Protocol (REP). - Easy deployment: Zero-touch discovery using Dynamic Host Control Protocol (DHCP), express setup, and fast bootup time (60 seconds) to help in migrating to an Ethernet environment without resistance. - Security: 802.1x, port security, and DHCP allow dynamic port-based authentication; Secure Shell (SSHv2); SNMPv3 provides encrypted administrator traffic during Telnet and SNMP sessions; TACACS+ and RADIUS authentication facilitate centralized control and restrict unauthorized users. - Resiliency: Flex links for fast recovery; Cisco REP protocol for fast convergence. - Manageability: Auto SmartPort, Web Device Manager, Telnet, HTTPS access, SNMP, CNA, and Cisco Prime Infrastructure 1.2.1. - Network Address Translation (NAT): Line-rate, hardware-enabled 1:1 static address translation designed to enable duplicate IP address usage in the Layer 2 machine node networks. - Industrial PoE: PoE (IEEE 802.af) and PoE+ (802.3at) supported on selected models. - Industrial automation protocols: Common Industrial Protocol (CIP) and PROFINETv2 allow integration with existing management platforms from Rockwell, Siemens, and others.